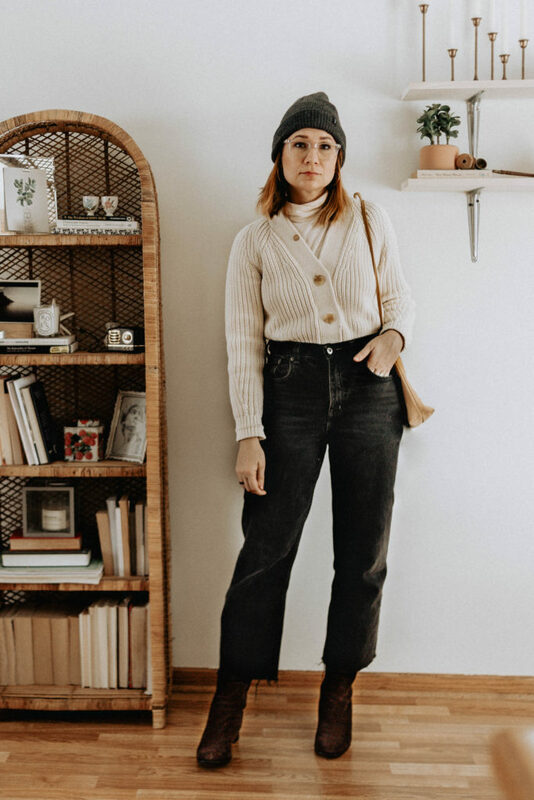 There’s only four outfits this week because it’s still really cold here + we’ve had lots of snow + we had head colds going through our house, and I figured you wouldn’t care to see a roundup full of my husband’s sweatshirts and leggings. On the days I did get dressed I was so happy to be putting on real clothes that I had a bit of fun. Like the first outfit with the tucked in cardigan, and in the third outfit with the pearl earrings and barrette. Both are a fun way to make an otherwise basic outfit a little special. my new sweater from Suunday. I’ve almost bought this sweater so many times since they released it, but I was unsure about the boat neck on it. 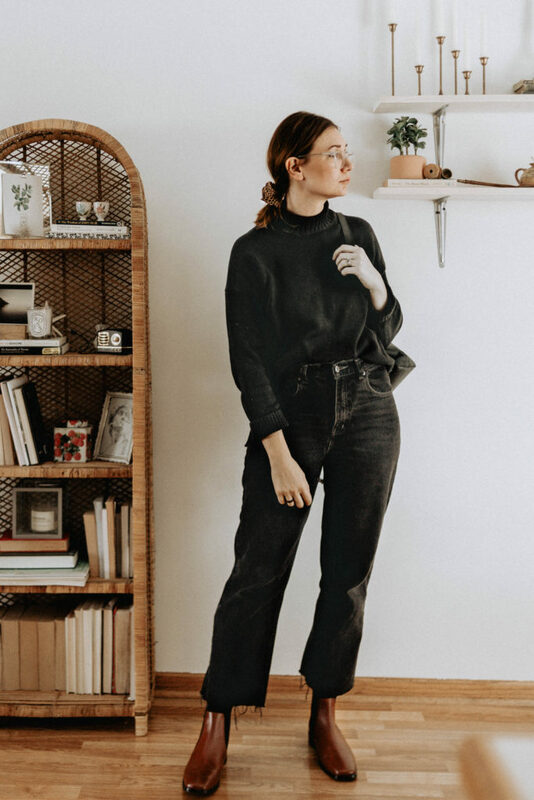 I traditionally have stayed away from boat necks, but after really enjoying my black linen tunic (which also has a boatneck) all fall and winter, I finally decided to just go for it… and I’m so glad I did. It’s such a flattering sweater! It’s cropped, which makes it easy to tuck into pants, and the balloon sleeves are a really fun, modern twist. And surprise! I actually really love the boat neck detail. 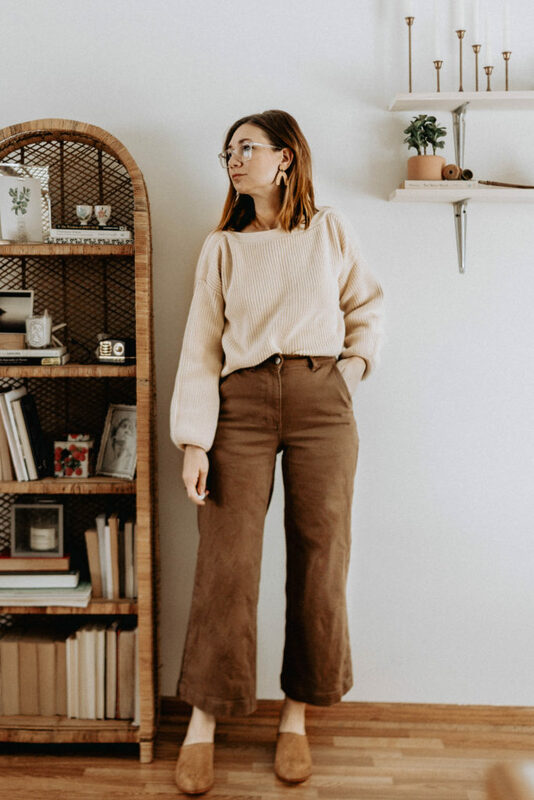 I was a bit worried about it being too similar to my Everlane cream sweater, but they are actually pretty different. 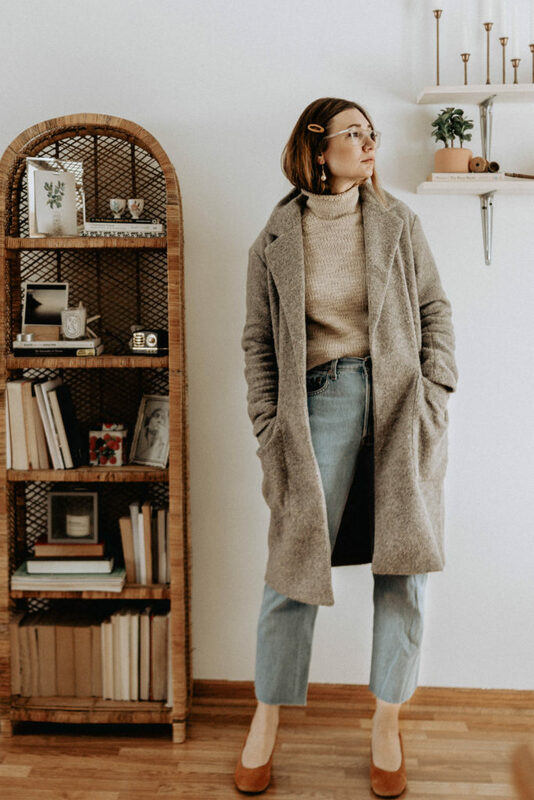 The color of this Suunday sweater is a lot warmer, and the overall vibe is much more soft and drapey. Just a note, that I did have to tuck the cuffs up into the sleeves because it was a bit long on me (I’m 5’4″), but I personally don’t mind having to do that. Second, I’ve been working on building up my boot collection and I was happy to find the Aquatalia boots in the first outfit for a really good deal on eBay. I’ve been eyeing the silhouette for awhile, but couldn’t bring myself to commit to the hefty price tag, so when I found these for less than 1/4 of the price secondhand I snatched them up. I’ve been into that chocolate brown color lately. For awhile, all I was drawn to was cognac, but this fall and winter I’ve been playing around with deeper shades of brown, and I’m not sad about it! But to sum it up, while I enjoyed my converse last winter almost exclusively, I’m happy to have a few shoes in my closet this winter that actually keep my feet warm and dry. I’ve discovered that these tank tops are the perfect layering piece under boatneck tops. I’m someone who has to have at least a light layer under a sweater, and the wide neckline of these tank tops keeps it hidden. With my skin being a lot drier from the cold weather, I’ve been enjoying this enzyme peel. It’s a really simple concept, that is actually super effective. I can honestly say my skin has never looked better since I started using it. It’s a bit of a steep price tag, but I only use it once or twice a week and a little goes a long way, so the mini size would probably last you a really long time. Finding products that work well on my skin have given me a boost of confidence, and I’ve been feeling less and less inclined to wear makeup lately. Most days, I’ve just been wearing this all natural cheek tint (color demure), and this brow gel. If I’m feeling a bit more, I’ll swipe on a bit of this powder foundation, this mascara and lipstick in the shade zip (can you tell I like this brand ha! ), although after watching this video with Jeanne Damas, I’m pretty convinced against the idea of mascara. It’s been so refreshing not having to deal with a ton of makeup removal at the end of the night. And side note about that foundation: it’s from organic makeup brand Antonym. I had bought a compact a few weeks ago, and the first time I used it Ella and Rosie also decided to “use it” and in the process completely destroyed it. I’m talking, I was in the bathroom for a minute, and I found the compact completely dug out and ground into their clothes and carpet. I cried. It was awful. I mentioned it on Instagram in a joking sort of way, and Antonym reached out and offered to replace it. I was so blown away! It came in the mail a week later. That kind of customer service makes me a loyal buyer (plus the foundation is really nice). Speaking of less maintenance, I’ve also been embracing my natural hair texture a bit more. I’ve just been sleeping on wet hair and then putting a few curls through the ends in the morning with my curling wand. It takes no more than five minutes, and I’ve been liking the effect. At night I just use a little of this air dry cream, and in the morning I spray this beach wave spray after I curl it. I’m fully embracing the pearl earring trend. I found a great pair at a thrift store recently, but I also just ordered this pair from Etsy… I’ll keep you updated once they arrive. My girls are really hard on their water bottles… they carry them everywhere, throw them everywhere, bang them on everything… yay! But the result is that we have to replace them pretty often. We’ve always gotten these Contigo water bottles, but I think this time around we’re going to go for the Klean Kanteen bottles. We’re trying to move away from using as much plastic with our girls and I like that those bottle are stainless steel. And finally! I’ve been trying out this breakfast subscription box from Oatbox. They offer three different subscription options that include a variety of their granola mixes, oatmeal packets, and breakfast bars. They have really yummy flavors (like this month’s salted caramel), and they also have a gluten free box for those of you who need it. It’s made breakfast super easy for me, which is what I want since the girls aren’t big dinner eaters and so wake up hangry and needing food immediately ha! If you want to give it a try you can use code karin.rambo with your first order to get $45 worth of Oatbox products for $20 (full disclosure: I will make a commission if you use my code). I hope you guys have the best weekend! And if you’re loving anything in particular lately, let me know in the comments! Across the country I was greeting the Vortex in the same ensemble plus a wooly scarf looped around my neck to catch the drafts. Inside or outside…so Chic! I love how signature your style is! Everything works together so well. Thanks Leah! I really appreciate that! All of these looks are amazing! And I’m a little jealous of your Aquatalia score! I have been searching for a pair of boots from them all winter and haven’t found the right ones for the right price yet :(. We have had both Klean Kanteen and Hydro Flask bottles for our kids and they’re both great!